African nation a strategic key for anti-terror ops, but US isn't too worried. 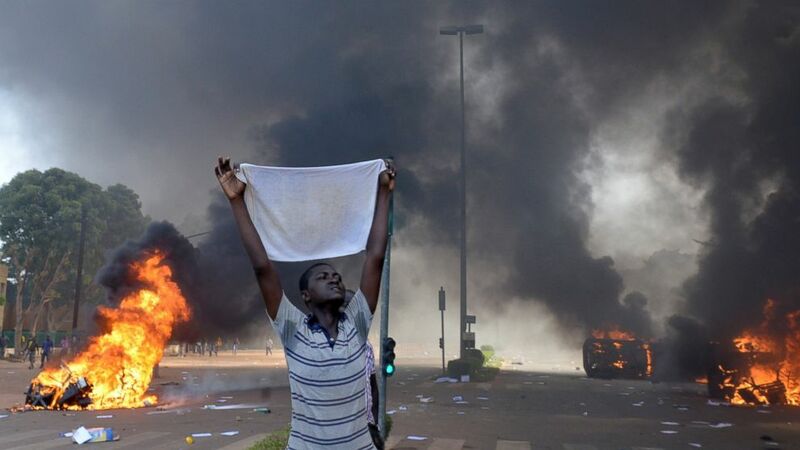 camera (Issouf Sanogo/AFP/Getty Images) A protester holds a white cloth as cars and documents burn outside the parliament in Ouagadougou, Burkina Faso, Oct. 30, 2014. 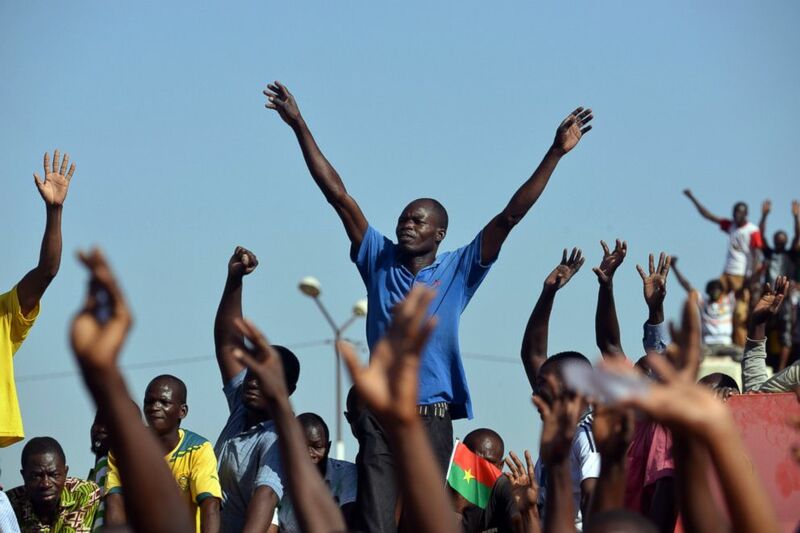 In a surprise announcement, the leader of the African nation of Burkina Faso said today he will end his nearly three decade rule -– marking a victory for thousands of angry protesters but prompting some uneasiness inside the U.S. national security community, which sees the tiny West African nation as a "key ally" in anti-terror operations in the region. One of the world’s poorest countries, Burkina Faso sits in West Africa between the two operational zones of two major terrorist organizations – al Qaeda in the Islamic Maghreb (AQIM) in Mali to the north, and Boko Haram in Nigeria to the east. As such, the government of Burkina Faso -- like its neighbor Niger -- previously agreed to allow American spy planes and drones to operate from its airfields, according to a 2012 report by The Washington Post. The Post called Burkina Faso’s capital Ouagadougou a “key hub of the U.S. spying network” in the region, from which the U.S. conducted a surveillance mission code named Creek Sand out of a small air base built on to the international airport there. Do you have information about this or another story? CLICK HERE to send your tip in to the Investigative Unit. (Issouf Sanogo/AFP/Getty Images) Opposition supporters takes part in a protest against a proposal to amend the constitution to extend President Blaise Compaore's 27-year-rule, Oct. 28,2014 in Ouagadougou, Burkina Faso. “The Government of Burkina Faso has recognized the importance of regional stability as an element in the fight against terrorism,” the State Department said. With today’s announcement from Burkina Faso’s longtime leader Blaise Compaore, the U.S. may have lost a somewhat reliable, personal partner in power. In 2013, Gilles Yabi, the International Crisis Group's West Africa Project Director, said that Compaore and "his men [had] succeeded in positioning themselves as indispensable mediators in the resolution of regional crisis." Yabi said that "turmoil in Burkina Faso" could mean the loss of a "key ally and strategic base” for the U.S. and France, according to the International Crisis Group's website. France has also undertaken expansive counter-terror operations in north Africa, including a major operation in Mali in 2013. However, the U.S. official didn't see the political change in Burkina Faso as necessarily having much of an impact on American counter-terrorism operations there. After all, in return for allowing U.S. to conduct its missions from Burkina Faso, the U.S. supports the country’s own anti-terror and border security operations. For instance, in 2013 “U.S. assistance facilitated the establishment of a 1,000-person border security task force and the training and equipping of a military counter-terrorism unit,” according to the State Department report. It’s the kind of help -- along with millions of dollars yearly in foreign aid -- that the U.S. is counting on Burkina Faso needing, whoever is in charge. Lt. Col. Vanessa Hillman, a spokesperson for the U.S. military’s Africa Command which runs operations on the continent, declined to discuss American counter-terrorism operations in Burkina Faso, but she said the military is “keeping a close eye” on developments there. While she said she doesn’t “want to guess at what’s going to happen,” Hillman said the military is “hopeful” that the change of power won’t affect Burkina Faso's posture towards American forces in the region. "[Burkina Faso is] a key ally," Hillman said. "In a region that’s so unstable at times, it’s good to have an ally."